This is the book you absolutely need to read if you are a millennial or if you care about one! Arm yourself with the numbers Washington would rather you didn’t focus on. It’s no secret that the millennial generation’s prospects are lower than their parents’—but this is not an inevitable “new normal,” as we’ve been led to believe. 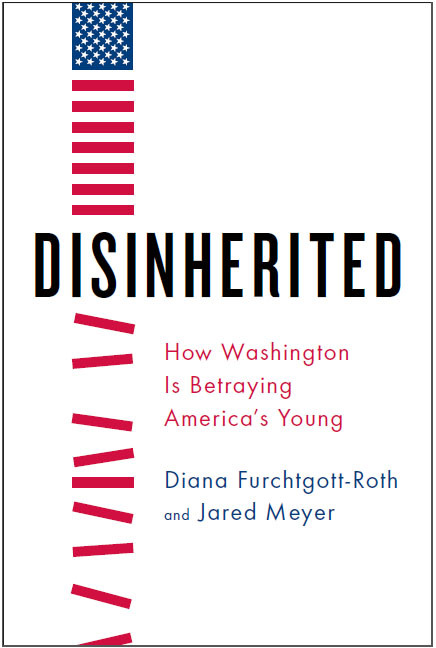 Instead, in a new book, Disinherited: How Washington is Betraying America’s Young (Encounter Books; May 12, 2015), Diana Furchtgott-Roth and Jared Meyer reveal that the millennials’ plight is the result of a generational war taking place in Washington, one in which government policies are systematically stacked against young Americans to bolster their elders. Disinherited is a timely book and a warning call to all Americans—young and old—because a country that betrays its young will never fully prosper. Diana Furchtgott-Roth, former chief economist of the U.S. Department of Labor, is director of Economics21 and senior fellow at the Manhattan Institute for Policy Research. She is a columnist for MarketWatch.com, and Tax Notes. Jared Meyer, is a fellow at the Manhattan Institute for Policy Research. His research interests include microeconomic theory and the economic effects of government regulations. Meyer is a regular contributor to Economics21, The Washington Examiner, RealClearEnergy.org, and City Journal.